The compact high-performance fan heater prevents formation of condensation in control or switch systems and provides an evenly distributed interior air temperature in enclosures. 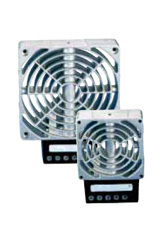 This fan heater is available with fan (HVL 031) as well as without fan (HV 031). Connection 3-pole screw connector 2.5mm², clamping torque 0.8Nm max. Important! Heater may only be operated together with fan. Danger of overheating! The compact high-performance fan heater prevents formation of condensation in control or switch systems and provides an evenly distributed interior air temperature in enclosures. 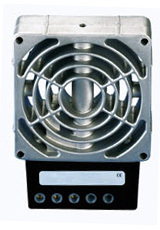 This fan heater is available without fan (HV 031) as well as with fan (HVL 031).